Mallya is now liquidating any and all of his assets to cover personal and business debts, but even if they are resolved and Kingfisher makes a turnaround, his reputation will likely never be repaired. 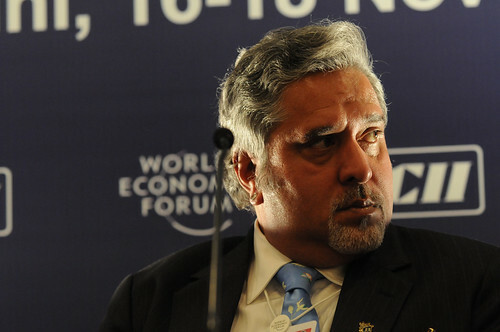 An arrest warrant has been issued against Force India co-owner Vijay Mallya, whose Kingfisher Airlines company has had its fleet grounded for the last two weeks with debts reported to be in the billions. The warrant, which is non-bailable, was issued on Friday in the Indian city of Hyderabad. It relates to bounced cheques amounting for 105 million rupees (£1.25 million) which Kingfisher issued to the operator of Hyderabad International Airport. Mallya, also the owner of Royal Challengers Bangalore in the Indian Premier League, failed to appear in court despite a summons. Mallya is trying to sell his stake in one of the world’s largest liquor companies to pay off debts. Photo by World Economic Forum. Formula One will travel to New Delhi in two weeks’ time for the second running of the Indian Grand Prix where the financial predicament of Force India co-owner Mallya is likely to be a major talking point. Meanwhile, McLaren have won an appeal against paying corporation tax on the $100 million fine they were handed by the FIA, the sport’s governing body, for their role in the 2007 spying controversy with Ferrari. Court documents revealed that McLaren’s fine actually amounted to £32,313,341 since the fine was $100 million minus the loss of commercial revenue from Formula One, which was withheld that year. Her Majesty’s Revenue and Customs can still appeal against the ruling.